Every year, the Super Bowl not only closes out the NFL season, but it gives advertisers a chance to showcase their goods and services on the biggest stage in television. Of course, some of these advertisers are the major movie studios, who always have a big presence during the game. During the lead-up to the Super Bowl, fans always try to guess which of their favorite upcoming movies will be promoted during this massive event, and today we have a report from The Hollywood Reporter which reveals which studios will be buying time during the game. The site's sources claim that 20th Century Fox purchased two 30-second slots, one of which will most likely be used for Deadpool, while the other could be footage from X-Men: Apocalypse (May 27) or possibly Eddie the Eagle (February 26). While the studio wouldn't confirm which movies it plans on promoting, Deadpool is almost a given, since the movie hits theaters on February 12, just a few days after the big game. The site also reports that the studio is holding multiple events in the San Francisco area over the weekend. 20th Century Fox is also reportedly planing major "on-the-ground events" for X-Men: Apocalypse, Eddie the Eagle and Independence Day: Resurgence (June 24), but the studio wouldn't divulge any specifics at this time. Independence Day: Resurgence cast members such as Liam Hemsworth and Jeff Goldblum will attend the Super Bowl, while unspecified stars from X-Men: Apocalypse may be in attendance as well. Hopefully the studio will confirm more details about these events as we get closer to the game on February 7. 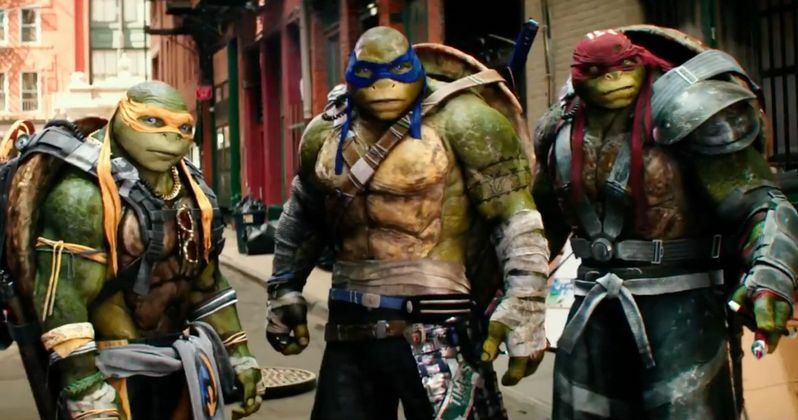 As for the other studios, Paramount has purchased one 30-second slot, which it will use to promote Teenage Mutant Ninja Turtles: Out of the Shadows, hitting theaters on June 3. Universal has bought a 30-second spot, although the studios wouldn't divulge which movies it will showcase. Universal could be promoting either The Huntsman: Winter's War (April 22) or Neighbors 2: Sorority Rising (May 20). Earlier today, we also reported that Bourne 5 will debut its first trailer during the Super Bowl, but that hasn't been confirmed by the studio. Both Warner Bros. and Sony are expected to sit out the festivities this year, but don't be surprised if some of the studio's movies are featured in different ads. The site reports that it's possible Warner Bros.' highly-anticipated Batman v Superman: Dawn of Justice may be featured through an ad by one of the studio's promotional partners, while other studios add they wouldn't be surprised if some of the movie's cast members were at the big game itself. There are also expected to be multiple movie ads during the Super Bowl pre-game show. The final major studio, Disney, is expected to promote multiple titles during the game, but the studio wouldn't specify how many different ad slots it has purchased. The studio also didn't divulge which movies it may promote, but the studio has a number of highly-anticipated movies coming out in the next few months, such as Zootopia (March 4), The Jungle Book (April 15), Captain America: Civil War (May 6), Alice Through the Looking Glass (May 27), Finding Dory (June 17) and Rogue One: A Star Wars Story (December 16). What ads are you hoping to see during the big game next weekend?